The kick-off events of the holiday season are only a MAX or bus ride away! Don’t let parking and traffic hassles turn you into a Grinch! Maintain your festive holiday attitude by taking TriMet whether you’re headed downtown for Macy’s Holiday Parade, cheering for your team in the Rose Quarter area or checking out the tree lighting at Pioneer Square this Friday. TriMet’s online trip planner makes it easy to find your best transit options with information on travel and walk times, transfers and cost. Visit trimet.org on your computer or mobile device for complete transit information and check TransitTracker for the next arrivals. 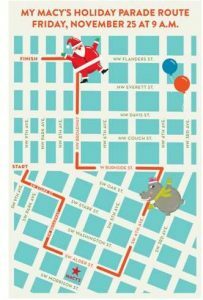 The My Macy’s Holiday Parade begins at 9 a.m. and goes through about 11:00 a.m. Five bus lines will be detoured from 7:30 a.m. until after the parade. One bus line will be detoured from 6:30 a.m. until after the parade. Expect minor delays to buses on some other lines as well as MAX trains as they hold occasionally to allow the parade to pass. 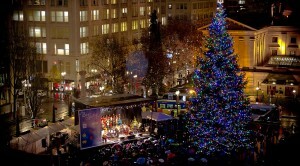 Gather at Pioneer Courthouse Square Friday evening as Portland’s holiday tree lights up. The ceremony begins at 5:30 p.m. and includes a holiday sing-along. To reach the square, get off one stop before or after. All MAX lines may experience minor delays due to the large crowd expected. Buses will detour off of SW 6th Ave. between 6 and 7 p.m.
Holiday revelers and sports fans alike should expect larger than normal crowds at the Rose Quarter as game times coincide with folks headed to and from the Tree Lighting. Be sure to plan extra time getting to your destination. The Portland Winterhawks play at 3:00 p.m. and the Trail Blazers start at 7:00 p.m.
Portland’s holiday tree isn’t the only festivity lighting up the night on Nov. 25. The Oregon Zoo will be all aglow as the annual ZooLights switches on for the season beginning at 5 p.m. Take the MAX Blue or Red Line to enjoy the dazzling display, which runs through January 1, 2016. Get a discount on admission, up to $5, by taking transit to Zoolights. Learn more. Many ZooLight goers park to catch the MAX at the Sunset Transit Center Park & Ride, but it can fill up fast, especially during Blazer home games. Consider using a parking lot further west such as our Millikan Way Park & Ride. Learn more about this parking option and others. Don’t get so caught up in the spirit of the season that you don’t cross safely. Please pay attention and stay alert when crossing MAX tracks and streets. Look both ways and make sure an umbrella, hood or other clothing doesn’t block your view of approaching trains, buses or autos. Awareness just takes a moment. Whether on the TriMet system, at the square or elsewhere in downtown Portland, be aware of your surroundings. If you see something suspicious, say something to a TriMet employee, a police or security officer, or by calling 9-1-1. To ensure the safety and comfort of all passengers, please avoid bringing large strollers on board. On buses, all strollers will need to be folded for safety. Holiday shoppers are welcome to bring bags and packages with them, but must make sure they don’t block the aisle, stairs or doorway. A list of what may and may not be brought on TriMet vehicles can be found here.